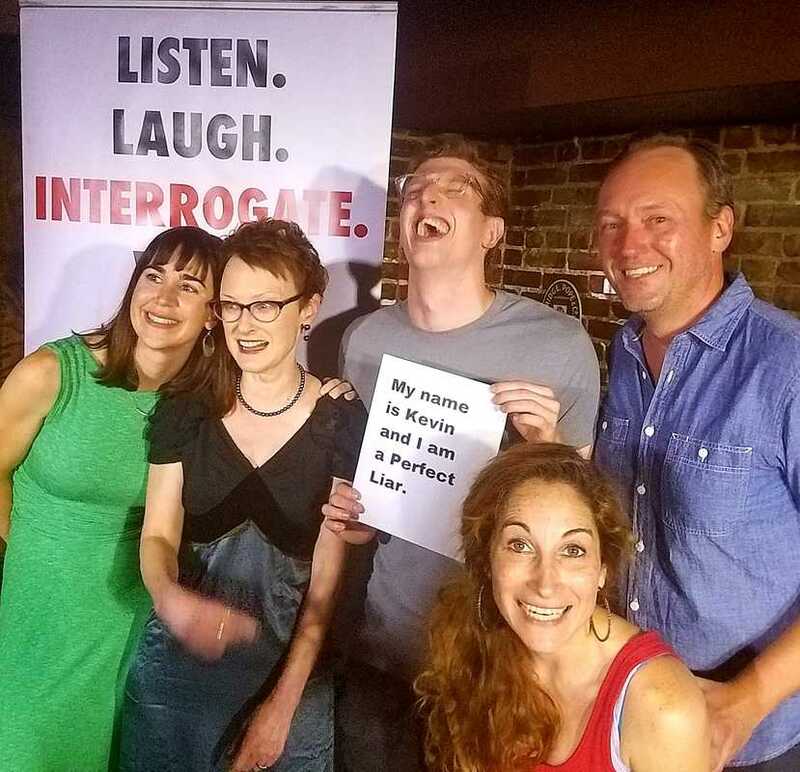 Undeterred by a change in schedule and the ceaseless madness of DC's roller coaster news cycle, the merry masses of Washington descended upon the Bier Baron Tavern and DC Comedy Loft to partake in a rare, mid-month edition of Perfect Liars Club and the final show of the 2017-18 liar-spotting season. Would the city's best and brightest go out on top or would their abysmal trend of failing to finger the fraud among our quartet of tellers continue? Only time would tell their collective fate. Was recent DC-transplant Kevin mistaken for a Scientologist by a local television news crew filming a story about the controversial religion? Did precocious pre-teen Erika break her pinky in a freak sledding accident? Did Louise get into a scuffle with a member of the Ukranian army after taking pictures during a military parade in Kiev? Did lovestruck Laura come down with a painful case of athlete's foot after stomping grapes at a wine-making party? As the story portion of the show came to a close, a growing confidence among the standing room only crowd seemed to indicate that the night's liar was in their sights. A collective certainty that quickly eroded once the interrogation began and the suspect's responses failed to net the 'gotcha moment' that everyone anticipated. Did Kevin's interview ever air on television? He did not know. Could Erika name the broken bone in her pinky? She could not. Could Louise speak conversational Russian with one of the audience members? Nyet. Did anyone else at Laura's party come down with athlete's foot? Unclear. Unable to produce a smoking gun, the sold-out crowd hemmed and hawed and hemmed again as they contemplated which of the four suspects they should vote for. And as each name was called and each had was raised and each vote was counted, a vocal crowd expressed both joy and displeasure with each of their counterparts' decisions. Ultimately, Louise's tale of international intrigue in a former-Soviet state was deemed most suspicious, garnering 38 votes. Kevin's story of mistaken identity and religious curiosity brought up the rear, netting only 24. Kevin, the would-be Scientologist, stood before them all, grinning ear-to-ear, another Perfect Liar minted at the hands of a duped DC crowd. And to add insult to observational injury, a joyful Louise disdainfully wagged her finger at the crowd, reminding the 38 attendees who had deemed her the night's prevaricator that they were wrong. All wrong. See you in September, DC.